GOLD – Represents Jesus as King THE OCTAGONAL GOLD BOX holds a hand-blown glass ball filled with 23 karat gold flakes that float like snowflakes. The ball is specially made so that the multiple curved surfaces reflect and refract the gold and make it dance and sparkle. The gold box measures 4 3/4 x 3 3/4 inches. FRANKINCENSE – Represents Jesus as Priest THE ROUND FRANKINCENSE BOX is covered in hand-stamped brass angels and is filled with the finest frankincense from the Dofar region of Oman – an area known as Sheba in Biblical times and said to be the source of the frankincense brought by Balthazar. The base and lid are satin lined and the box measures 4 1/2 x 3 1/4 inches. 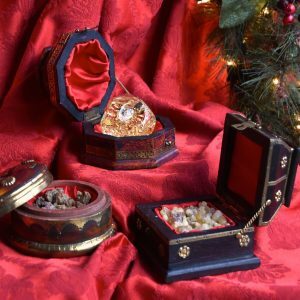 MYRRH – Represents the Burial of Jesus THE SQUARE MYRRH BOX is a satin-lined treasure trove with brass chain and latch (the gold box also has a chain and latch) and holds the finest Arabian myrrh. The box measures 4 1/4 x 3 1/4 inches. Together, the Three Box Set is a beautiful way to begin a new Christmas Tradition. Display your Gold, Frankincense & Myrrh along with your Nativity Set and bring new meaning to our tradition of giving gifts at Christmastime. The set will last a lifetime and will be a gift that is appreciated year after year. After Christmas, the boxes are so gorgeous that they can be closed and left out year-round! 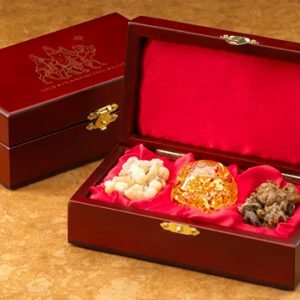 INCLUDED WITH EACH SET: A gold embossed display card that tells the story of the Three Kings and a Certificate of Authenticity stating that the gold is real and the Frankincense & Myrrh are from the same regions as the original gifts. 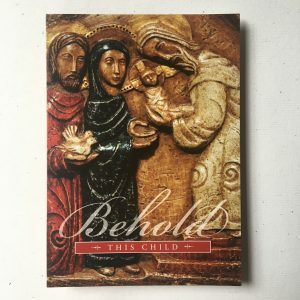 We like to highlight just how authentic The Original Gifts are by saying, “2000 years ago, when the Three Kings got off their camels, this is what they had in their hands.” The set is beautifully packed in its own, gift box covered in a brightly colored sleeve that shows and fully explains the set – making it easy to sell off the shelf. Package of 10 Christmas cards and gold foil envelopes. 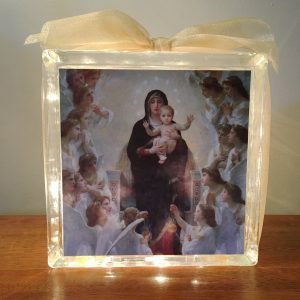 The art on the cover is taken from Spiritus Sanctus Academy in Ann Arbor, Michigan (spiritussanctus.org) – this Catholic K-8 school has all the images from the complete set of Mysteries of the Rosary adorning one of the hallways. 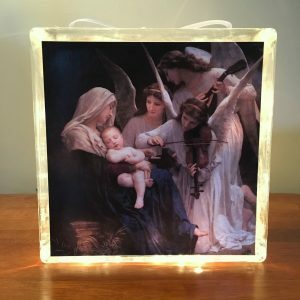 The relief sculpture is by the Sisters of Bethlehem of Livingston Manor, New York – purchase their captivating art at: artisanats.bethleem.org. 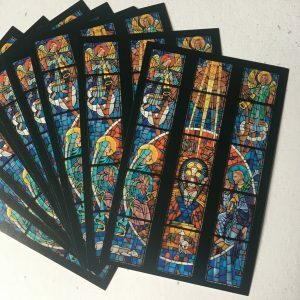 Set of 10 holy cards. 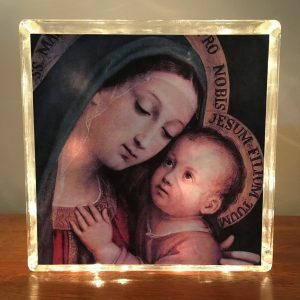 Stained glass nativity window is from The Church of the Divine Child in Dearborn, Michigan.